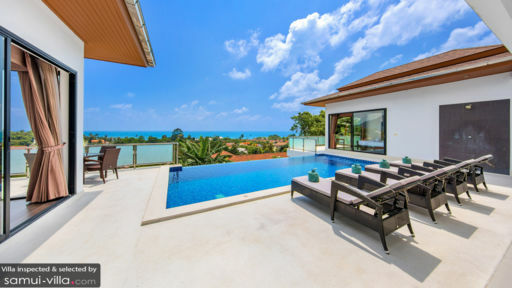 High on the hills just two (2) kilometers from Lamai Beach and just a minute from the main road is Sunny Banks – a luxury villa built and designed as an organic part of the surrounding natural environment. Up here it is tranquil and serene. With only the sea breeze breaking the silence as it whispers through the trees and sweeps throughout the villa. Up here, the sight of the distant horizon creates the impression that, now, you are a world away from life as you know it. You begin to wonder – how can a piece of paradise such as this be so close when it feels so far? Magic? Perhaps. Because soon you’ll realize that a vacation at Sunny Banks is, after all, one magical escape. Sunny Banks has a total of four (4) Master Bedrooms. Two of these open out to verandas with outdoor furniture where you can just sit back as you look out to the ocean. 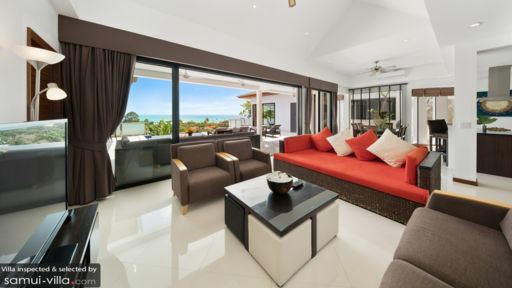 Both bedrooms also have direct access to the View Deck and to the Infinity Pool. A distinct feature of the bathroom in these bedrooms are the bathtubs which are provided with a view of the open sea through a large glass window. The third Master Bedroom is located towards the back of the villa. And the fourth is at the ground floor which opens to a veranda with equally panoramic views of the breathtaking scenery. As you take a calming dip in the Infinity Pool out at the wide View Deck, something magical happens. The world, suddenly, seems to turn blue – the waters of the pool, the spectacular view of the ocean as well as the open sky. You are left mesmerized even as you get out of the water and choose to lie on one of the nearby day beds for some sunbathing. You may even add to your enjoyment a refreshing bluish drink as you cool down at the shaded sitting area. The Living Area is fully furnished with couches and easy chairs. A wide, flat-screen TV is provided as your only window to the outside world. At the other end of the spacious indoors is the Dining Area. Behind the dining table is a counter provided with high chairs for extra seating. The counter looks over the fully-equipped Kitchen where a resident chef is on hand to concoct authentic Thai cuisine as well as international and personal favorites. Wherever you are in this area – whether you’re lounging or dining – you still get panoramic views of the sea through floor-to-ceiling glass windows. In charge of Sunny Banks is a multilingual Guest Manager. Housekeeping is done daily. Security is round-the-clock. The in-house chef, however, prepares breakfast and lunch only. While staying at the villa, you must experience the sights and sounds of Lamai Beach and the surrounding area. Swim, dive and engage in water sports. Along the strip, you’ll also find casual to fine-dining restaurants offering local or international cuisine. At night, the beach pulsates with a party atmosphere almost everywhere you go. Other must-see attractions are the nearby Hua Thanon Fishing Village, the Hin Ta and Hin Yai Rock Formations, the local temple Wat Lamai as well as Wat Khunaram – home of Monk Loung Pordaeng’s mummified body. For souvenirs, you can shop at the Tesco Lotus Mall or the Lamai Night Market. On a Sunday, stroll through The Walking Street and marvel at the many stalls selling an interesting array of clothes, crafts and delicious Thai street food.